Here I am, running to partial victory (I would have won if I had succeeded in getting ahead of the several hundred people in front of me). 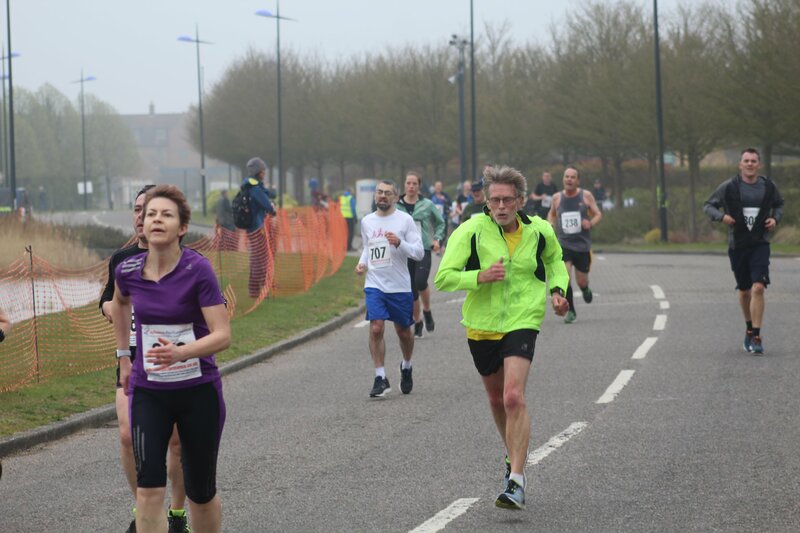 This is the Cambourne 10k, just outside Cambridge. It was overcast and cold but good running weather for most. I should have worn gloves. More importantly my right knee and hip held up well. 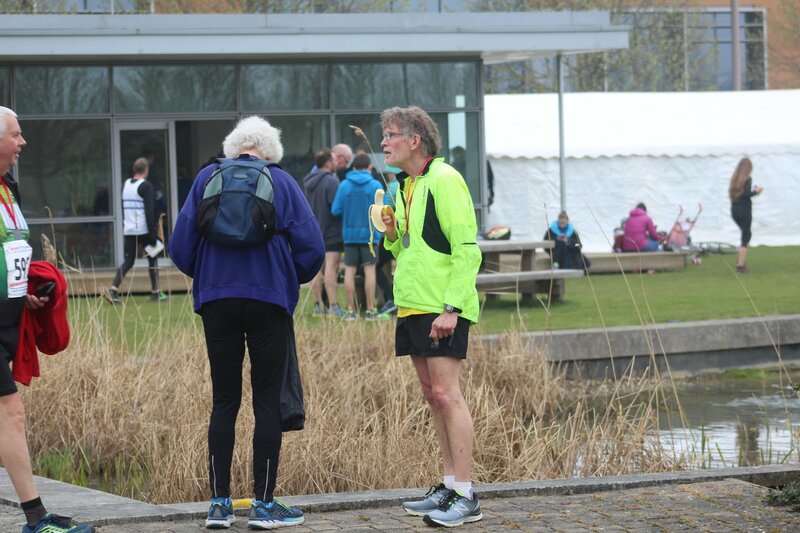 At the beginning of March I ran the Cambridge half marathon, a hard road surface and about ten days later my right knee and a right finger became swollen. I self diagnosed osteo arthritis. I was advised not to take ibruprofen because of my cardiac medication but I could take Voltarol (diclofenac diethylammonium,a topical gel, which I did. Result? Both knee and finger swelling quickly reduced. Like a lot of people of a certain age I get occasional arthritic local flareups particularly in my hands and they often disappear. But my swollen knee ACTUALLY STOPPED ME RUNNING! I’m now back to running fairly normally and regaining lost form. I also took the decision to rejoin Cambridge and Coleridge Athletics Club (C&C) and went training with them this week. I gave up C&C nearly three years ago because I thought I was getting too slow to do the type of training I wanted to do with them, mainly road running. I’m still the slowest in the group but I’ll see how it goes. Some sessions will be more suitable than others and I’ve always got the option of doing track sessions instead. Two running chums. Both beat me in the Cambourne 10k. I eat my banana, place the skin on the edge of the pond, my pal steps on it, skids and falls in. It doesn’t happen. Brexit. It’s a Pandora’s box. Mostly we gravitate towards people whose views are similar to our own, if we know or suspect them. A lot of the time we don’t know people’s views and they may not know mine but because little clues suggest they might be substantially different, we avoid argument or friction. We get along by not challenging each other we don’t fall out because certain issues are avoided. Brexit has sidestepped this pragmatic arrangement and frequently lays bare a range of beliefs, attitudes and values which are shocking. I’d find it more than acceptable if the arguments for staying or leaving the EU revolved around economic or business considerations but I believe the majority of the peope who voted to leave Europe did so for racist and xenophobic reasons, underpinned by their anger at the bewildering pace and changes of modern life and aided and abetted by the fascist Daily Mail. Loving the 12 mile weekly run! At the moment! Upside : I’m running more frequently. Downside : I’m being stalked by a chicken.